Hello botters! With breaks being released a tutorial explaining everything in detail is probably helpful to some, so here goes. 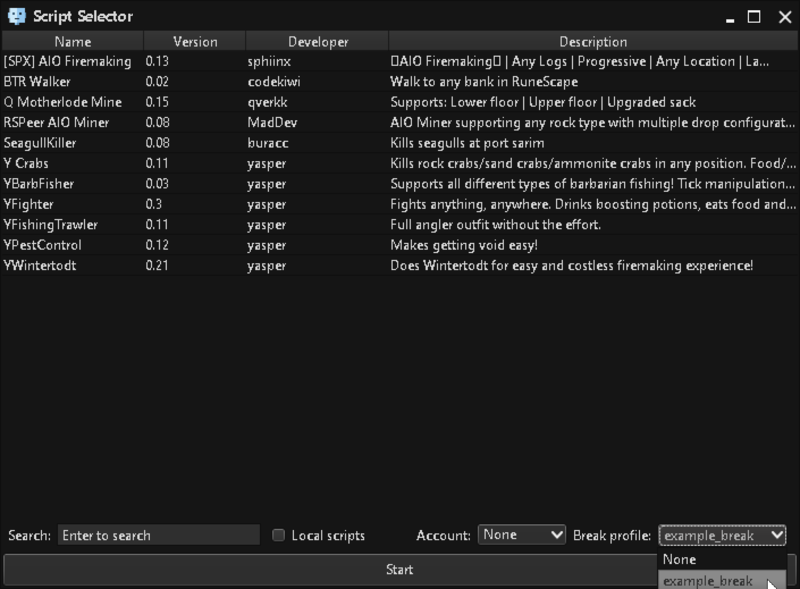 By adding break times manually using the two text fields at the bottom of the window. By generating a random profile using a standard break time deviation. You can do this until you've made a profile that satisfies your breaking needs. After this you can still obviously remove certain entries and add some breaks yourself. The standard behaviour of the break handler is to stop running the script after the last encountered break. You can however modify this behaviour if you want to bot for longer periods and continue using breaks. 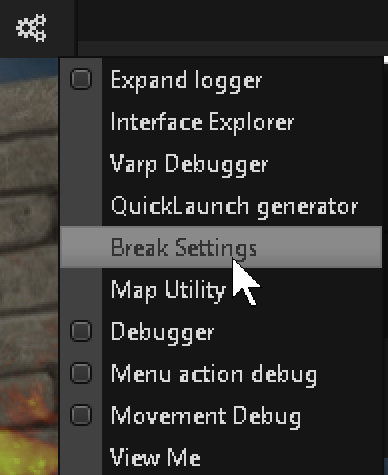 To do this simply select the checkbox: "Repeat breaks after last break" and the break handler will restart the breaking profile. We understand that obviously you do not want to break at the exact time for the exact period every time you use a given breaking profile as that would make it easier for Jagex to recognize your breaking behaviour. Therefore the break time/duration is randomized internally so that you won't be breaking for exactly one hour after 3 hours and 40 minutes every single time you use this profile. If you have any further questions feel free to leave them on this thread! So excited for this! Great work. a scheduler from the botpanel would've been much better. @merc Could you elaborate on that? It would be really cool if we could have a botpanel feature that allows us to schedule start/stop of Quick Launch configs. @merc YES! this is exactly what i have been looking for across multiple botting clients. If this was implemented i would invest entirely in rspeer. One thing to say about the breaks though. When a client takes a break it seems to use a bunch of CPU. Any way to fix that? Cant wait! Much love for @MadDev here. 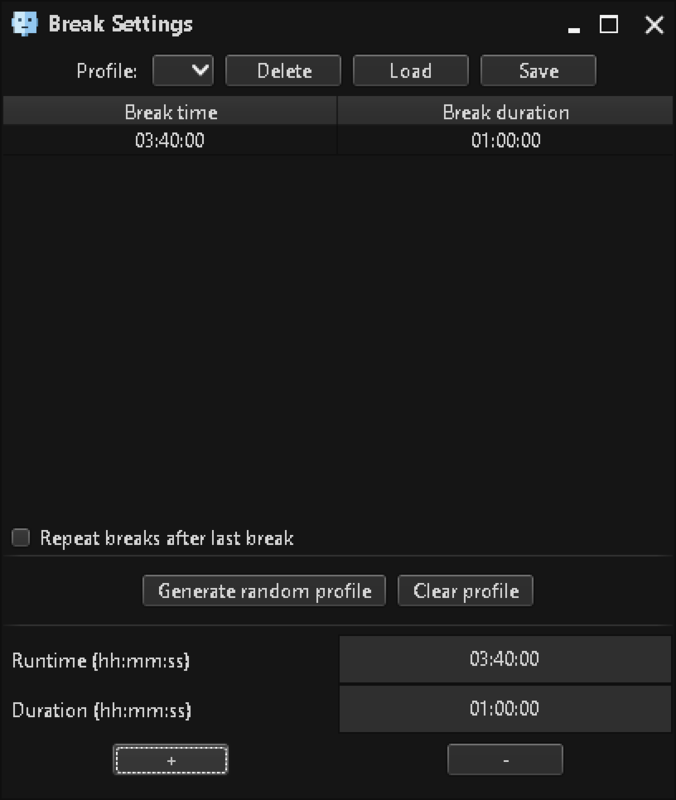 Hey, it says that the break time / duration is randomized internally, so does that mean if you create a normal breaking profile it will automatically randomize it without you doing anything else, or do you have to select "Generate random profile" and change the randomization values yourself? Also, under "Generate random profile," typing in an amount of time will tell it how often to break, but how does it decide how long those breaks will last? It will already randomize the break internally. 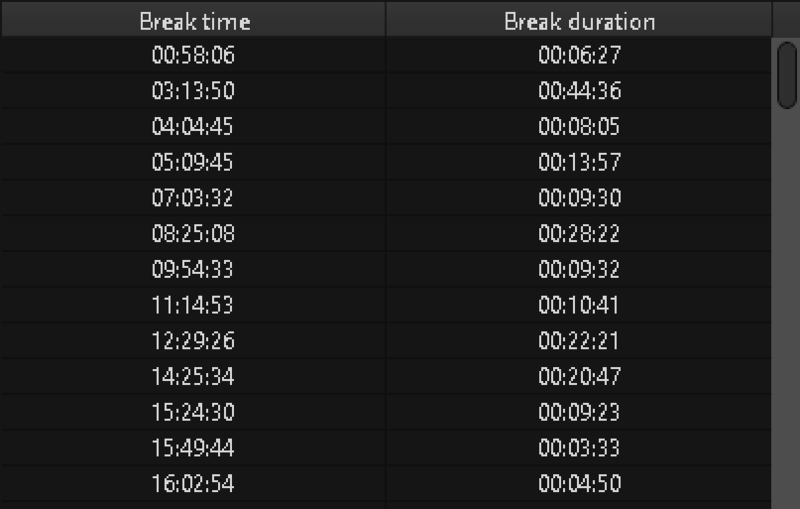 The break duration for the random profile is based on the time since the last break. Anything under 30 minutes will not work too well because you will basically have 30 seconds of a break time every half hour which isn't very functional. I will however make sure the client doesn't freeze out when you select this break time however! Its been working for the past couple of days, but today when it finishes the first break and logs in, it stops the scripts. I've made another break set to test again and it again stops my scripts after it logs in. Hey, you should add a feature to make it so that you can tell it to start the script in 3 hours. Like if you are going to sleep, but you don't want the script to start until like 3 hours after you sleep. @Yasper Just to clarify, do developers have to add code to their script for this to work correctly?